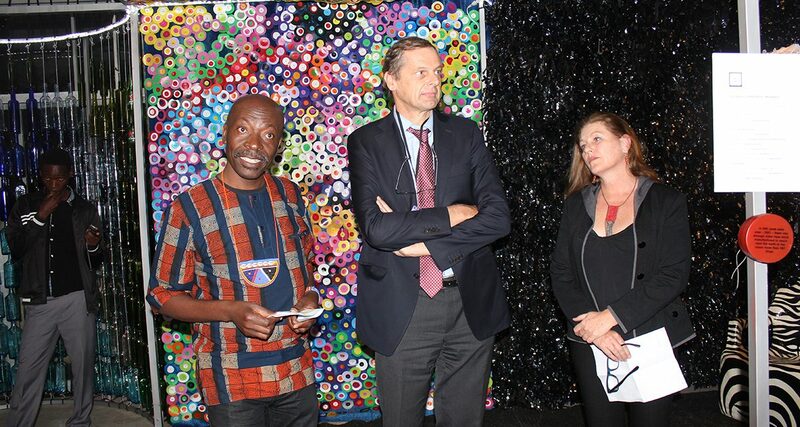 From Left: The Curator of the National Gallery of Zimbabwe, Raphael Chikukwa; the organizer of the Exhibition, Laurie MacPherson and the Head of the European Union Delegation in Zimbabwe, His Excellency, Mr. Phillipe van Damme made remarks at the opening of the Own Your Rubbish show. Own Your Rubbish at face value, offers crucial insights into the effect that Humanity and its consumption has on the Earth; moreover this exhibition shows the self-destructive impact that, as a race, Humanity continues to indulge itself in its implosive approach to surviving on the planet by use of hazardous materials which will in the long run devastate each and every biome existent on the planet. A brainchild of photographer Laurie MacPherson featuring various creative enterprises and eight visual artists. The means in which the race will extinguish itself are somewhat out of a Cold War Nuclear War novel; however the reality of the Science and Security Board has extended its focus on Climate Change as opposed to Nuclear arsenals. Although the descriptions of an impending apocalypse grip the mind relentlessly, Own Your Rubbish approaches the topic of Environmental responsibility in a concise and honest manner that seems to postulate that there is hope. The Tank Installation is the live interactive feature that consists of recycled water tanks and cable spools converted into somewhat acoustic pods lined by canvas cushions. A crate which has been up-cycled into a Television stand plays several clips that emphasize the disastrous rate at which waste is polluting the planet. The background music is eerily explanatory of the message, to some point where one cannot ignore the brutal truth of Chester Bennington’s vocals on “What I’ve Done”; a conscious play by the artist to provoke both aural and visual senses. This interactive hub serves to give individuals an opportunity to relax and focus all their attention on the exploits on-screen ; thereafter, continuing the conversation amongst themselves. Several pieces are on sale; the Impala trophies made out of plastic and wire are pro animal life and crafted with attention to pattern and form. 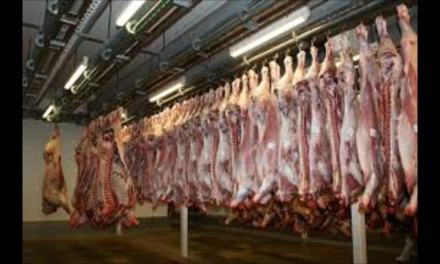 Upon closer inspection, the skeletal wire frame is tactfully shaped whilst the strips of PET strips flesh out the basic frame in a way that reminds one of Venetian Blinds. Arguably, the Impala heads could have a very fitting functionality as lampshades. 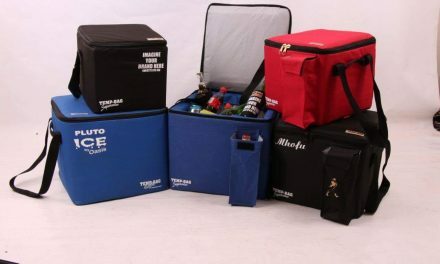 Non-biodegradation is the major threat which Own Your Rubbish addresses as various issues ranging from nuclear leaks and the continuous dumping of refuse in oceans are discussed. From the Zimbabwean viewpoint, such matters may apparently be turned a blind eye to; being landlocked and non consumptive of Nuclear energy, the events centering on these particular facets of the exhibition tend to be completely foreign to the local audience, however one gets to question what effect these crises do to countries upstream and the effects on weather patterns and such come to mind. On the Nuclear energy side, one may view how the effect on marine life draws out and indirectly that may put freshwater species at risk of dying due to radiation. Apart from the habituating prowess of the octopus there is the clear and present stress on all creatures of the water as the placards within the exhibition point out. 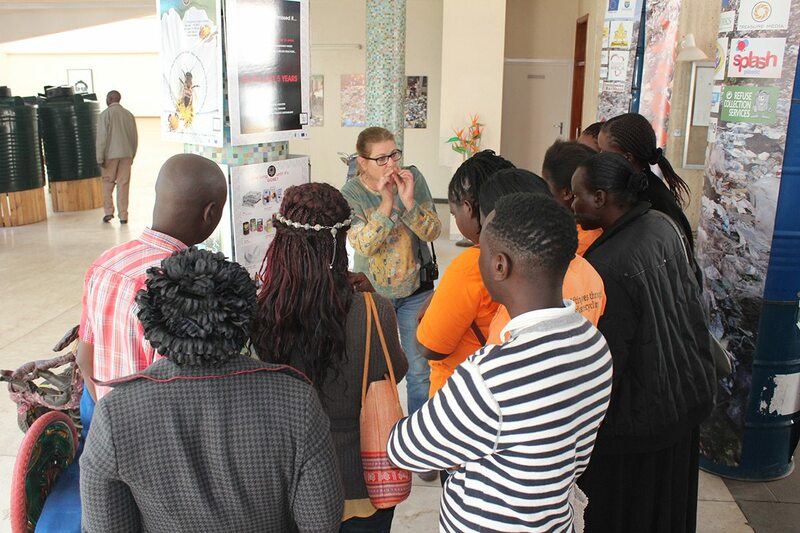 The act of Up-Cycling and Art have always been cohorts as indicated by the presence of eight practicing visual artists. What stands out is the presence of concept chairs constructed from found objects; sculpted into various fragmentary thrones, each with a witty title addresses the grim reality of society’s awful waste management. Ngonidzashe Tsiga’s Tyred Out clearly brings to question the disposal of vulcanized rubber tyres wherein the various uses for these objects such as the construction of swings and obstacle courses comes to mind. The chair, at first sight, bears no semblance to ergonomic ease, however upon sitting on the seat there is an immediate wave of comfort that is contrary to the rigid appearance of the treads. Clive Mukucha’s Pipe Dreams is more conceptual as it bears a demeanor that projects the presents of sound through form. 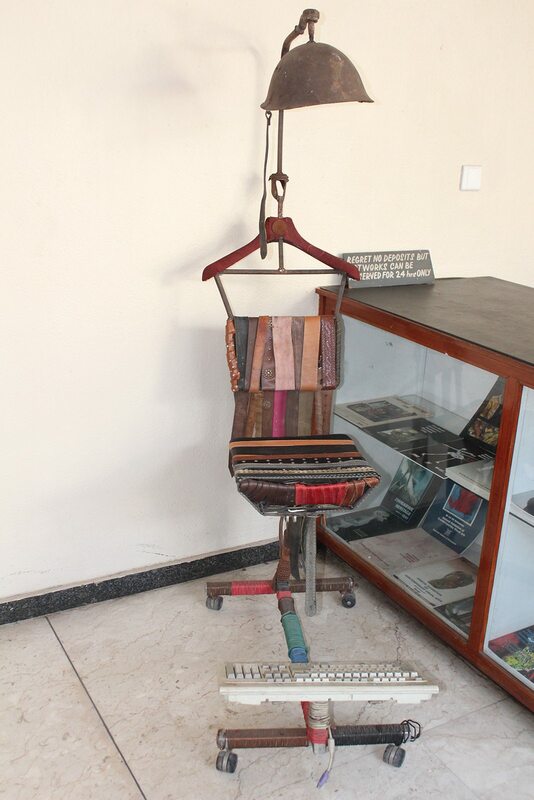 The prize winning Reading Chair by Victor Nyakauru has all the trimmings of a recliner, however composed of metal and leather belts. This chair is definitive of “Reduce, Re-use and Recycle” mantra as it is endowed with clearly beat down material such as leather, cable casing and the crowning helmet; which can be used as a lamp. The hanger forming the stand for said lamp can purposefully hold the readers jacket and consolidates the functionality of the chair. The footrest is a computer keyboard and for one with the nimble talent to type with their feet, the design of this recliner would surely suit them well! A curtain woven out of VHS Cassette tape speaks volumes on the objective and brings an aura of how ephemeral anything manufactured could be. It’s proximity to infographics on Waste Management centers and tips on how compost can be built brings a nostalgia of how video tapes are now obsolete and sadly have very few functions to be repurposed. Herein rises the panacea of what media such as compact discs, video tapes and floppy discs can be used for- expert craftsmanship and design. Overall, Own Your Rubbish serves as a vehicle to provide ‘in- your- face’ reflections on the issues facing Zimbabwean society and the globe. The notion that Waste Management is highly viewed as mundane while coupled with a growing population and hyper consumerist sentiment that bleakly quashes hope and any insight towards positively changing the world towards a cleaner and greener lifestyle. It echoes Former American Vice President Al Gore’s documentary An Inconvenient Truth in a manner that the immediate threat is always brushed aside and without foresight, the planet and all its occupants shift ever quickly towards catastrophe, an approaching extinction level event by humanities own needs and wants. 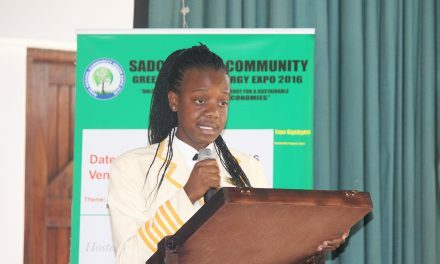 The National Gallery of Zimbabwe will hold its Annual Tavatose/ Sisonke Schools and Colleges Exhibition in July under the theme Waste no Waste; Trash is Treasure, supported by the Environmental Management Agency. The National Gallery of Zimbabwe (NGZ) is a gallery in Harare, Zimbabwe, dedicated to the presentation and conservation of Zimbabwe’s contemporary art and visual heritage.